Paint a chubby wood body and a wood bead with craft paint. Make a neck collar from ribbon and ears from felt. A fur pom-pom is used for the tail. 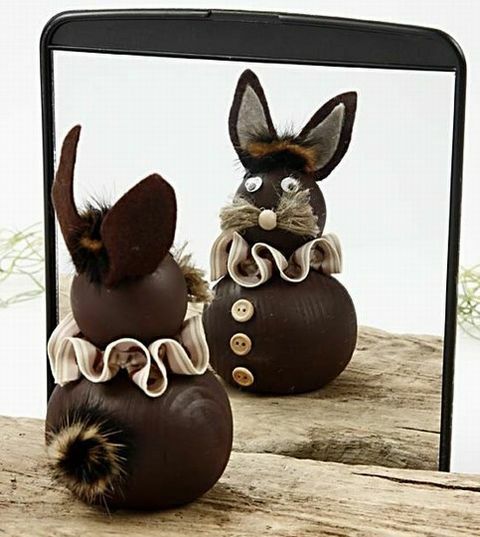 The cute little bunny is easy to make. Glue wood buttons onto the body. Make a neck collar using tack stitches (sew up and down and pull tight). Cut ears from felt using the template and glue them on. Glue on wiggle eyes. A bit of flax twine with a wood bead are nose and whiskers. Everything is glued on with a glue gun.